Working on the Arboretum grounds means I have the joy of interacting with native plants and animals every day. I get to watch newly-planted trees sprout their first leaves and newly hatched goslings sprout their first feathers. I see migratory birds on their way north and south, caterpillars turning into butterflies, spiders wrapping up their breakfast of grasshoppers, and the cozy tunnels made by fastidious skunks and armadillos. But by and large my favorite living thing to observe here at the Arboretum is fungus. That’s right – that crusty yet slimy, multicolored, spore-producing stuff that grows quietly all around us. 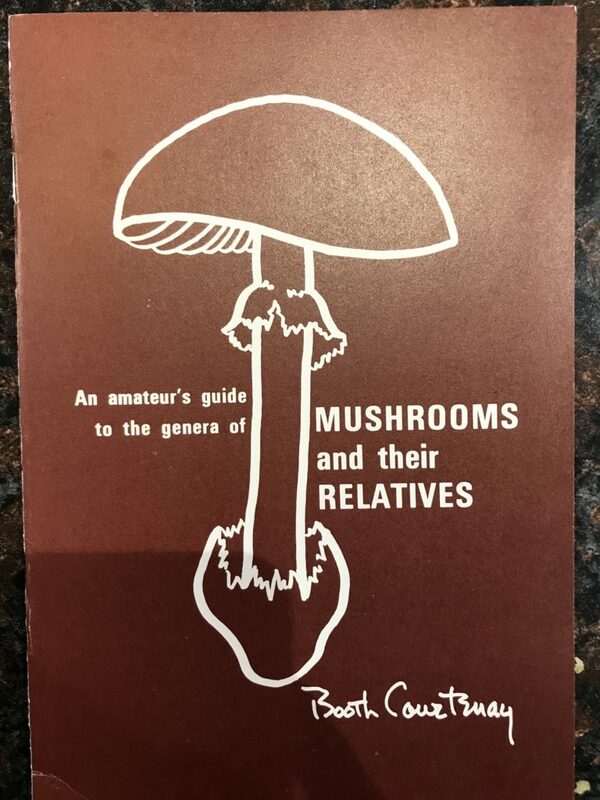 If you want to acquaint yourself with the world of mushroom identification, buy yourself a small, simple guide to get started. I got this handy book for only $2 at the UW Madison Arboretum gift shop and have found it very useful for beginners. Fungi is a much misunderstood life form (and no, I am not just talking about my coworkers Brad and Scott, fun guys though they are!). While people often come to visit Dyck Arboretum to watch birds or spot their favorite wildflowers, I have yet to hear anyone shout in delight, “Guys, look over here! A stinkhorn mushroom colony!” And such a shame – I have seen so many weird and wonderful fungus (and fungus-like) creatures at the Arb that I can’t help but be enthralled by them. In our Prairie Window Project the dense mat of grasses and plant debris create a rich environment for fungus. These tiny mushrooms, only the size of dimes, were scattered throughout a ten-foot square area. Perhaps you noticed I used the word ‘creature’ for fungi in the above paragraph. Aren’t mushrooms just strange, fleshy plants? No. Technically speaking, a fungus is genetically more similar to you and me than it is to a plant. In scientific nomenclature, fungi occupy their own Kingdom (there are 6 major Kingdoms of life, for animals, plants, bacteria and so on). Fungi do not photosynthesize like plants, and cannot make their own food (autotrophy). Like us, they must feed on other organisms to survive (heterotrophy). Fungus do not have roots, stems or leaves, and do not store energy as a starch like plants do. They reproduce by releasing spores into the environment, or by simply breaking apart (fragmentation) or budding (growing a clone). I spotted these beautiful shelf fungi growing on a fallen log at UW Madison Arboretum. The first step into nerding out over fungus is to classify your observations. It is a tricky job, and scientists today are still in a tizzy about the genetic ancestry of fungus. For the layperson, let’s stick to the basics: yeasts, molds, and mushrooms are all types of fungus. Mushrooms are perhaps the most charismatic and well known fungi – shelf-like, gelatinous, or toadstool shaped, they spring up seemingly overnight. What we see as a ‘mushroom’ is only a small part of the organism, just the fungus’s reproductive organ. The rest of it exists as a massive web of string-like hyphae in the soil or decomposing wood. There are several trees around the Arboretum in various states of natural decay sporting impressive shelf fungi. (Or perhaps they are spore-ting it?) But don’t be fooled – lichen, commonly found growing on trunks and tree branches, is NOT fungus. It is actually a combination-creature; algae, cyanobacteria, and fungus all sharing a body to create a new being, with an endless array of forms. I see some flat grey lichen growing here, but I can’t tell if these charming little white growths on our Prunus virginiana are lichen or fungus – they cling like lichen but the sort of soft, furry characteristic of fungus. Perhaps a reader can help me out on this one! 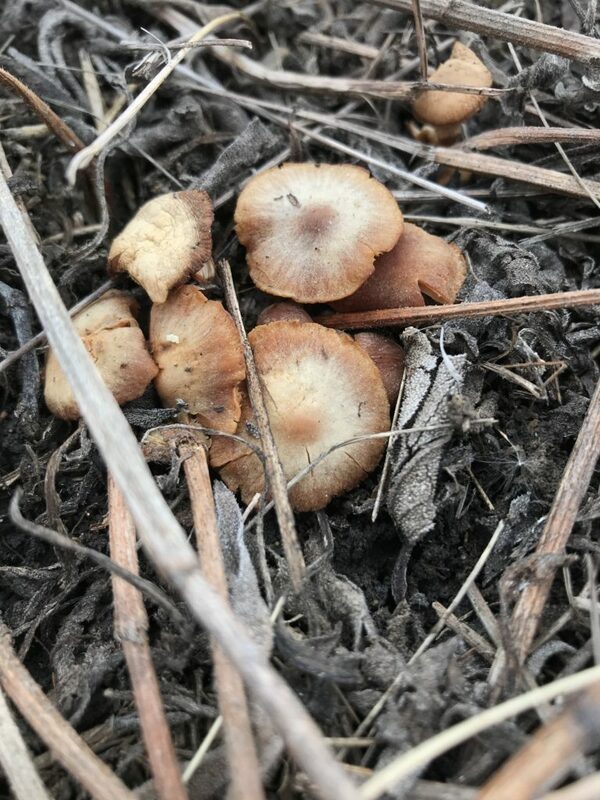 People may assume Kansas is not a good place to find fungus – much too dry and hot. Not only do we have some delicious edible mushrooms growing wild in Kansas but a plethora of other fun-to-hunt (but potentially toxic!) fungus. In fact, they grow almost everywhere on the planet and have countless forms, colors, and methods of life. Scientists only know of 120,000 species, but estimate there are millions more waiting to be discovered. 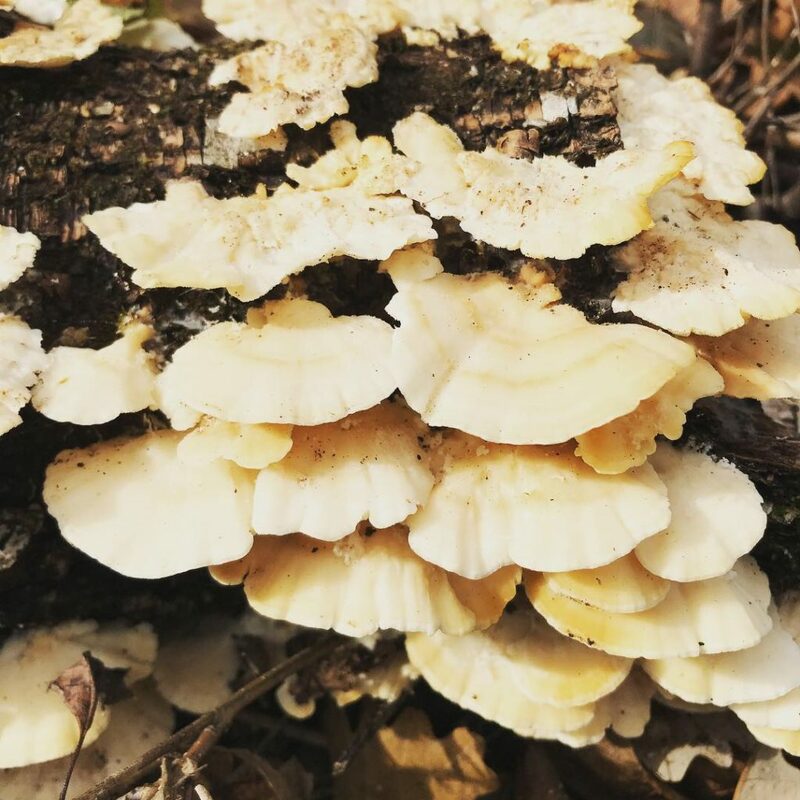 To find your first fungus, search around decaying wood piles or heavily mulched garden beds. Check carefully and often around tree stumps; different mushrooms will feed on the rotting roots at different stages of the decay. This red-belted bracket fungi (maybe Fomitopsis pinicola?) formed on the trunk of a long dead redbud tree near our parking lot. This beauty was almost 12 inches across! 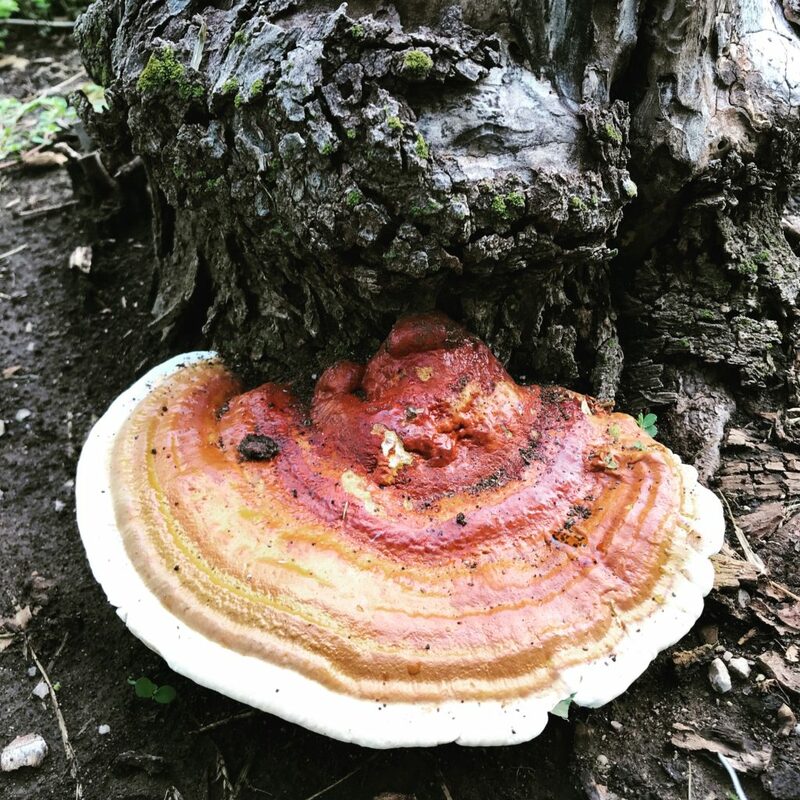 On your next visit to Dyck Arboretum, be sure to get a peek at some magnificent fungi on our grounds. 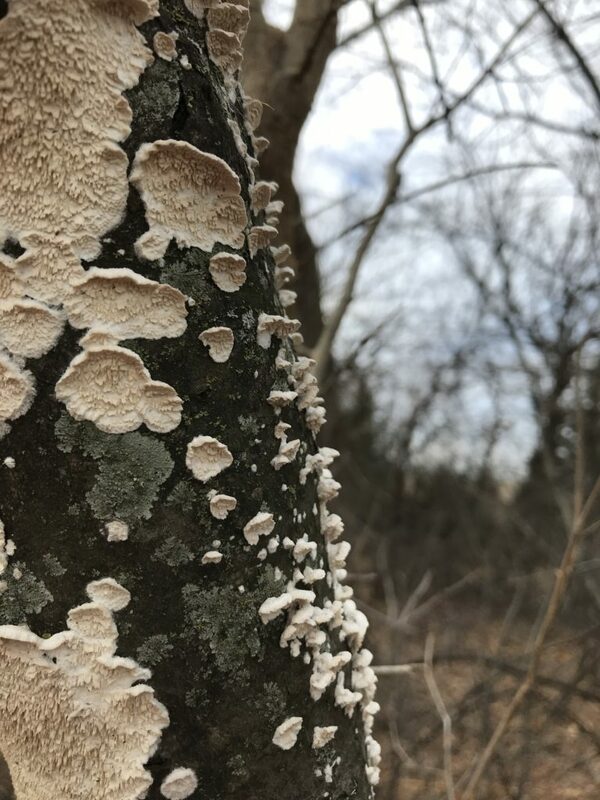 Hunting for fungus, in all its forms, is a meaningful way to interact with nature and build a relationship of wonder and respect for the land we live on. The landscape may still be dominated by the browns and tans of winter, but inside the greenhouse is a different story -oodles of green buds bursting out of dormancy, waking up to warm, humid air! It’s refreshing to spend time around these green little beauties, and it is an indicator that plants outside will soon be doing the very same thing. Buds excite us for many reasons. They portend flowers and color, and the lush greenness to come. But they also are a signal of life! Life after the cold winter months, life after dormancy – a breaking forth from a long sleep, part of the natural cycles of activity and inactivity that we all experience. Beyond metaphor, their botany is just plain cool! 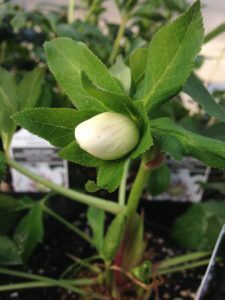 Here are a few things to know about the buds emerging on your landscape plants at home. Salix Mt. Asama is an early bloomer. It’s bright yellow and pink pollen clusters are showy, suspended on fuzzy, whimsical silks. A pal? A friend? I certainly see them that way! But scientifically speaking, a bud is an embryonic shoot just above where the leaf will form, or at the tip of a stem. As I previously covered in my November post on pruning, there are lots of different types of buds: terminal buds (at top of stem), lateral buds (on sides of stem, producing leaves or flowers), dormant buds (asleep and waiting for spring), and many more. 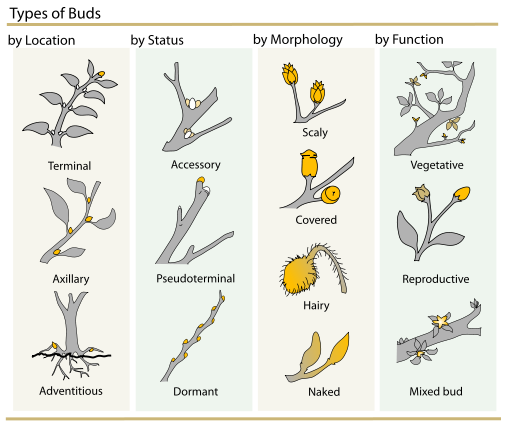 Buds can be classified by looks or location. ‘Confetti Cake’ hellebore has a pure white flowerbud, but when it opens will be spotted with dark purple. Inspecting your buds is important to stopping a potential problem. The first thing to inspect for is aphids. Buds are succulent little treats for these pests, and have less waxy protective coating than mature leaves, making them an easy target. Often the buds won’t show much damage until you have a nasty infestation, so inspecting buds early is key. Be sure to look on the inner folds of the bud if possible, as aphids are quite good at hiding themselves. 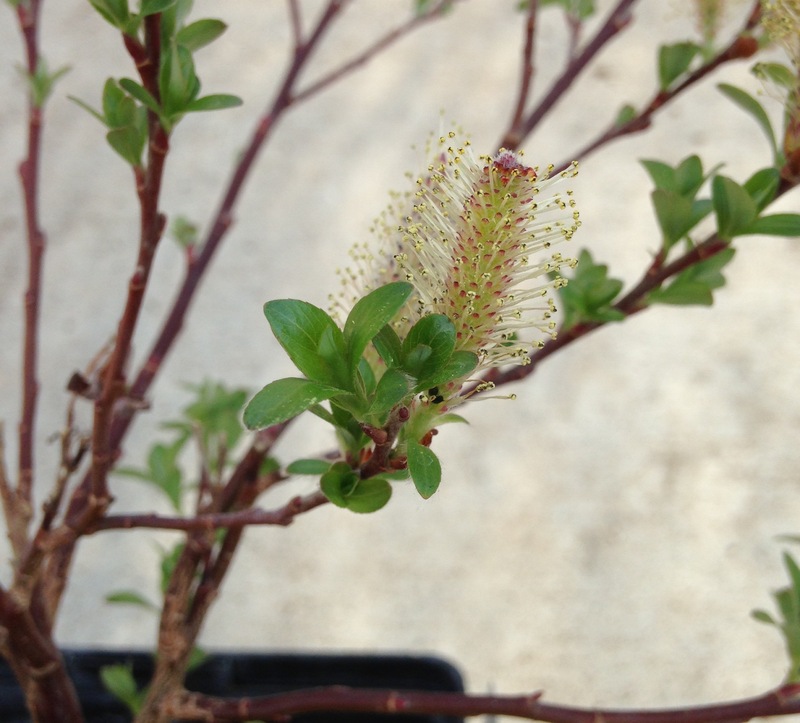 Ogon spirea blooms earlier than other spirea, long before it has fully leafed out. The flowers are white with yellow centers and closely clustered together, making a nice effect in the spring landscape. Even if you see buds on your trees, shrubs and outdoor plants, that may not be an indication that everything is A-OK. All too often I see lots of buds on my potted shrubs only to find out that they are dead – by pressing gently on them, they easily break off and reveal dead wood at the wound. If you have any doubt about the hardiness of a shrub or perhaps neglected your winter watering schedule, take a close look at the buds. Buds that are soft and mushy or dry and brittle are a bad sign, and may indicate dead wood that needs trimming back this year. Firm buds that don’t break off at a light touch, be they green or still brown, usually mean they are alive and waiting to spring open. I’m dismayed that FloraKansas Plant Festival is still months away – so many early blooming plants are at their best right now, budding out and coming alive! Come visit the Arboretum and enjoy all the buds (and bulbs!) that are waking up! As we approach our Native Plant Landscaping Symposium on February 24, where speakers will tell stories about their favorite native plants, they may make reference to using certain families of plants. Thinking about the organization of plants in this way makes landscaping with native plants even more interesting. In a way, native plants are like people. The closer people are in genetic relation to each other, the closer they resemble each other. Family members share skin color, body type, hair texture, and facial features. While a unique name is given to each person to recognize their individuality, part of that name is kept the same and recognized both with close and distant relations. These closely-bonded people develop similar habitat preferences and interact with their environment in similar ways. In 1758, Swedish botanist Carl Linnaeus developed a Latin naming system for plants and animals. Each plant or animal was given a “genus” (generic name) and “species” (specific name). Plant families include genetically related plants share floral structures, leaf arrangements, and stem shape. Multiple genera can make up a family. Along with the scientific name, people have also given each plant species many common names or nicknames. Asclepias incarnata, otherwise known as swamp milkweed or marsh milkweed, is a member of the DOGBANE FAMILY. 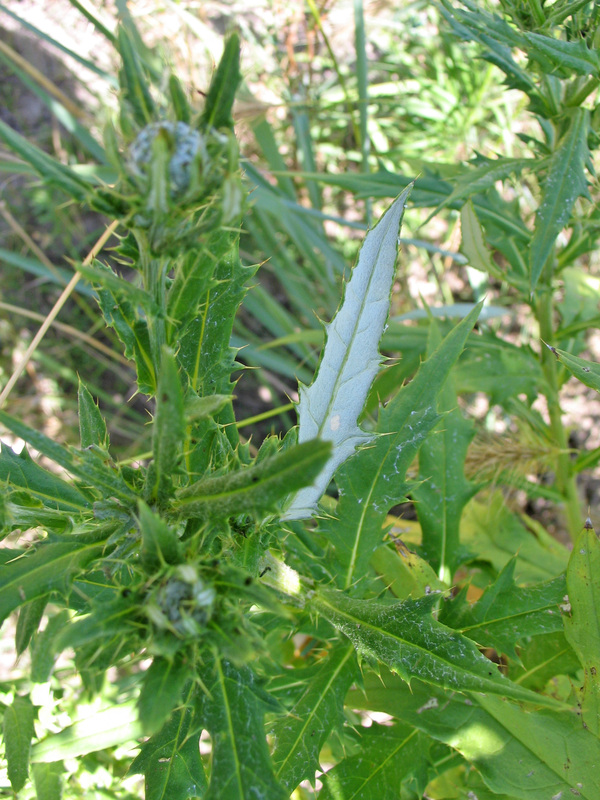 For example, plants in the DOGBANE FAMILY have five-parted flowers, opposite leaves, and a milky juice in the stems and leaves with a bitter-tasting, toxic compound that protects the plants from being eaten by insects (excluding monarch butterfly larvae). 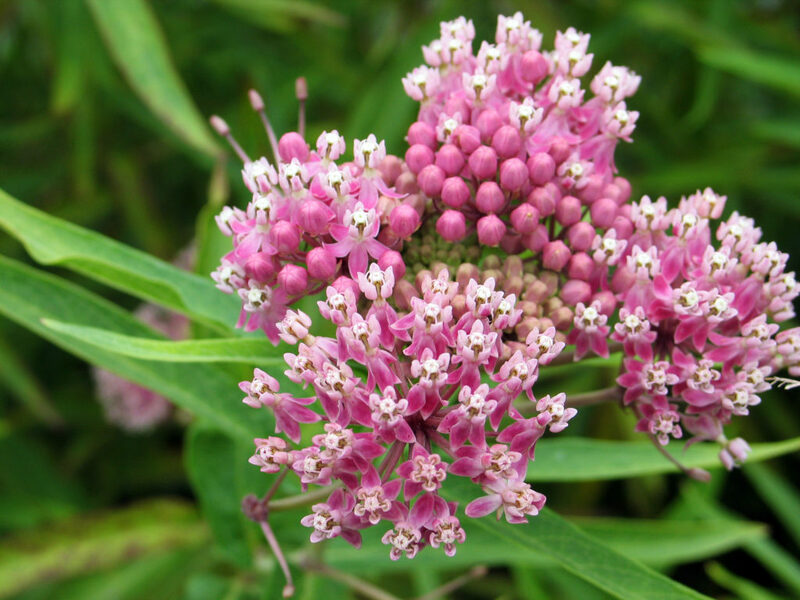 In this family, the milkweed genus (Asclepias) has 22 different species in Kansas. You may not recognize from their common names that butterfly milkweed and green antelopehorn are related, but when you see their Latin names, Asclepias tuberosa and Asclepias viridis, you will know better. 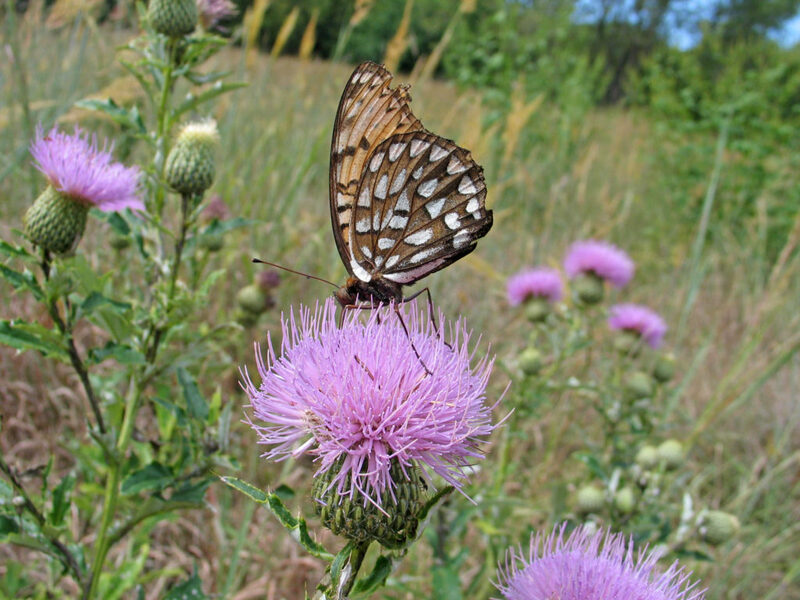 Kansans have many good reasons for landscaping with native plants. Some of the best benefits are: 1) they provide natural beauty throughout the seasons, 2) they attract pollinators and other wildlife that are part of the food chain, 3) they offer drought-tolerant, environmentally-friendly plants to work with, and 4) they represent our state’s rich prairie natural heritage. By learning more about native plant families, you can add more diversity to your garden, creating a wider range of habitat for wildlife. 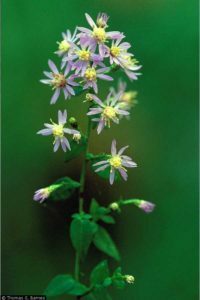 Includes the largest number of species in the prairie; many flowers or “florets” in one head with both inner disk florets and outer ray florets. 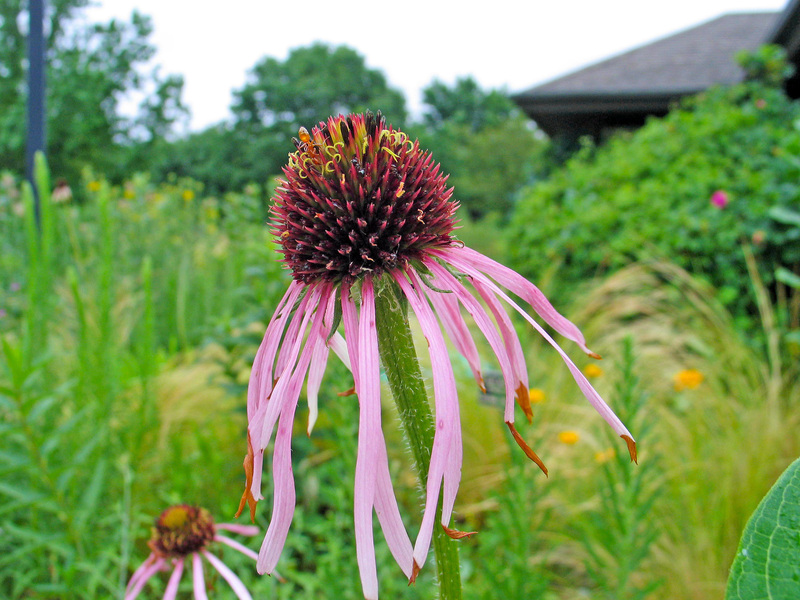 Echinacea pallida, otherwise known as pale purple coneflower, is a member of the SUNFLOWER FAMILY. These “legumes” have a distinctive five petal flower, form bean pods, and fix nitrogen into the soil thanks to special bacteria living on the roots. 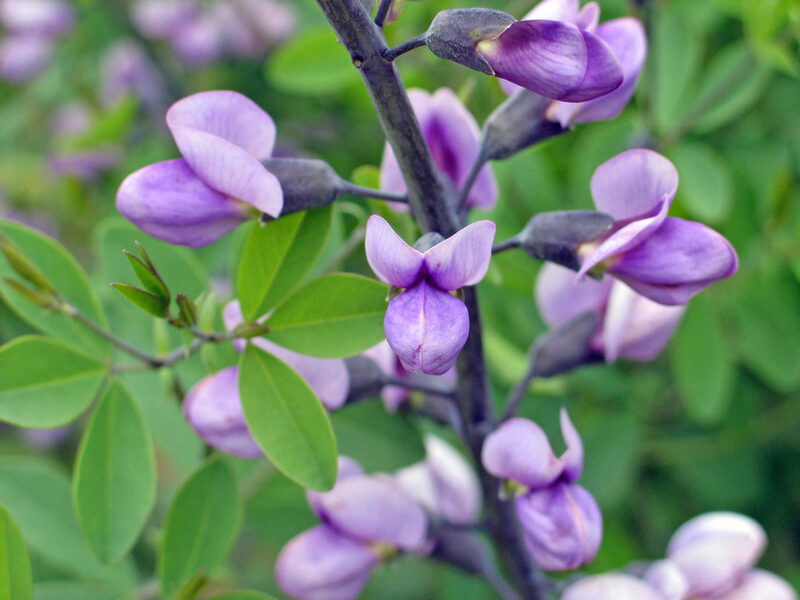 Baptisia australis, also known as blue wild indigo or blue false indigo, is a member of the BEAN FAMILY. These plants have square stems and opposite leaves that create aromatic oils. Most garden herbs are in the mint family. 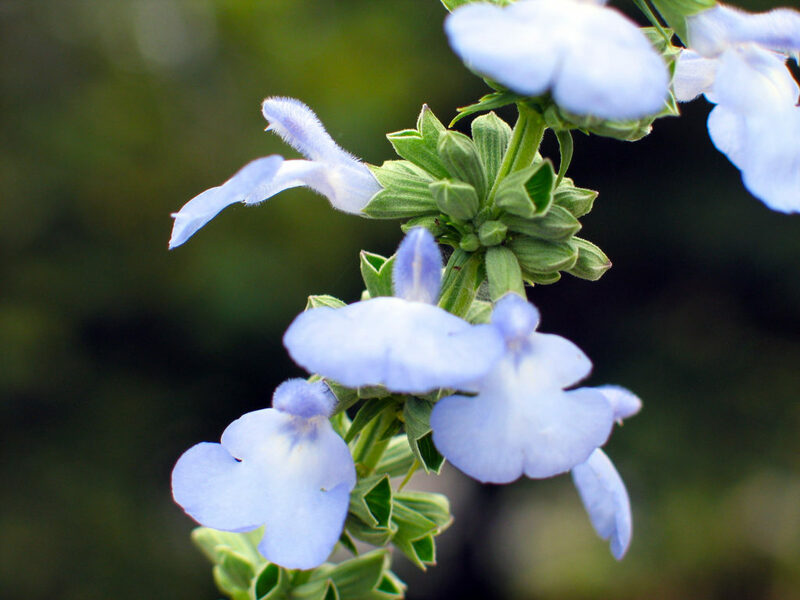 Salvia azurea, also known as blue sage, is a member of the MINT FAMILY. Flowers are colorless and wind pollinated, and stiff fibrous stems help carry fire when dormant. Most agricultural crops are in the grass family. 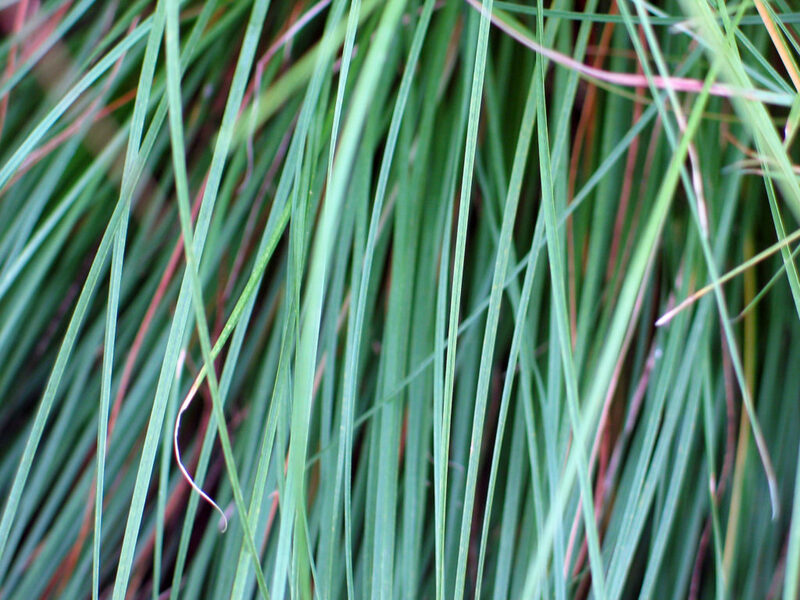 Schizochirium scoparium, also known as little bluestem, is a member of the GRASS FAMILY. 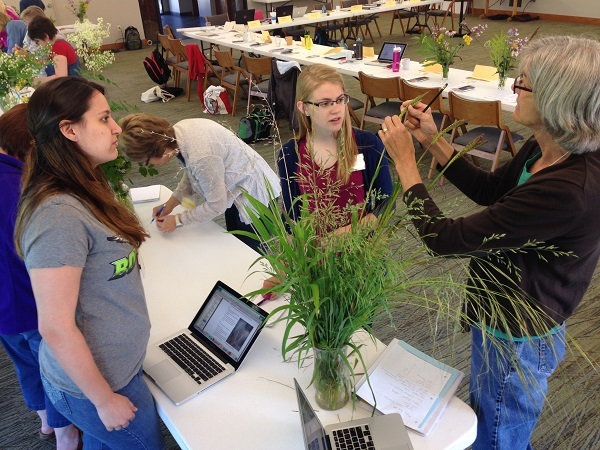 Teachers examine grass flowers while learning about plant families. Though true winter approaches, there are still a few warm, sunny days ahead to be filled with raking leaves and garden clean-up. Here at the Arboretum we leave our perennial gardens uncut through the winter to create winter habitat and protect the soil, but just like you, we are plenty busy piling up leaves and preparing our Christmas decorations. If the weather is truly obliging, you may even be tempted to bust out your pruning shears and neaten up your trees and shrubs. Less work waiting for you in spring, right? But be warned, overzealous and untimely snipping could cost you! Below is a seasonal summary of pruning information compiled from the four corners of the web, along with a botany primer on buds and the old wood/new wood conundrum. Don’t lose your lilac blooms, prune at the perfect time! Photo by AnRo0002 (Own work) [CC0], via Wikimedia Commons. The truth is, most plants don’t need much pruning. Pruning should never aim to distort the shrubs natural figure, only enhance its shape and thin branches to ward off disease and breakage. Gardeners often ask me when to prune their (insert flowing shrub here) for the best bloom – the truth is, I don’t have all that knowledge locked in my brain! I often whip out my phone to research the specific plant and find out if it blooms on new growth or last years wood. If a plant flowers on last years wood, pruning in winter or spring means you will cut off all the already produced dormant flower buds and greatly reduce or eliminate the coming year’s bloom. Here is a run-down of when to give some common landscape plants a haircut. Lilac (Syringa) – blooms on last years wood, prune immediately after flowers have faded, before next years buds form. Hydrangeas – very tricky, as not all grow the same! Cut back H. paniculata and H. arborescens in late winter; they bloom on new wood. H. macrophylla and H. quercifolia bloom on last years wood and can only be trimmed immediately after their blooms fade. Pines – early spring just as new growth begins, but not before. Surgeons go through years of rigorous schooling before they make a single cut, so why don’t we spend a few minutes learning about buds and shoots before the amputations begin, eh? A bud is an embryonic shoot just above where the leaf will form, or at the tip of a stem. 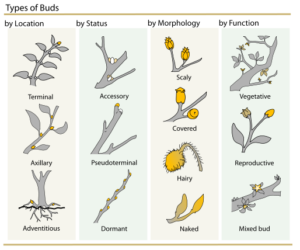 There are lots of different types of buds: Terminal buds (primary growth point at top of stem), lateral buds (on sides of stem that produce leaves or flowers), dormant buds (asleep and waiting for spring, shhh! ), and many more. In light pruning, such as pinching or heading, cut just above the bud at a 45 degree angle. 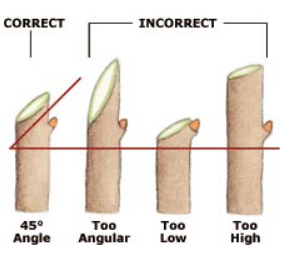 Lowes has a great guide on the 4 types of pruning, and a very helpful graphic seen below. 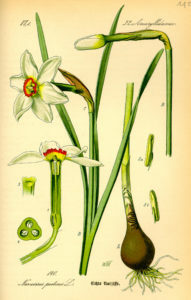 A cut too far above or below the bud may result in die-back and withered stems. Cutting directly above the bud tells the plant to release hormones signalling the bud to break dormancy and sprout! Learning about the process of plant dormancy can ensure we aren’t wounding plants at vulnerable times, The Spruce has a great article on this here. Research first, then cut carefully, friends! Are Bulbs Good for Pollinators? My volunteers and I have been spending many hours this fall planting daffodils and tulips around the Arboretum grounds. All told, we will have nearly 800 new blooming bulbs coming up next spring, down a bit from the 1000 we planted last year. We all love the aesthetics of fat yellow daffodils and spritely crocus, but I had never considered whether they served an ecological purpose. Supposing (incorrectly) that most bulbs I order are native to the Netherlands, what good would they be to our local pollinator population? I have now been down the rabbit hole of research and will summarize here how bulbs affect pollinators, which bulbs attract them and proper bulb planting technique. 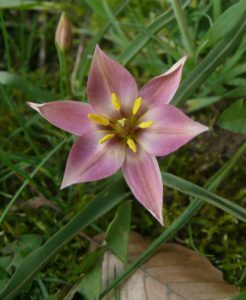 Tulip humilis (aucheriana) is a wild-type tulip that does well in gardens and meadows alike. Long before people started admiring their blooms, most of our favorite bulb flowers were being visited by pollinators. Such is not the case for today: modern hybrids selected for the biggest bloom and brightest color sometimes become less useful to pollinators. Flowers that have been distorted too far from their original form may have less nectar or be entirely sterile, rendering them useless as a food source. Hybridization can also sacrifice the flower’s strong scent, leaving aroma-sensing pollinators (like nocturnal moths) lost without lunch. As humans try to improve flowers for our own eye, we inadvertently disrupt their role in nature. Insects and flowers have an important relationship directly related to the flower’s form. If it changes drastically, certain insects may no longer be able to reach the nectar. Because of this, avoid buying highly modified ‘double’ and ‘triple’ bloomers or extra-petaled flowers that will likely inhibit a pollinator’s ability to feed. Though we may associate the bulb trade with Holland, the native range of daffodils is the Iberian Peninsula and tulips grow wild in Turkey and Central Asia. Crocus were originally native to southern Europe, the Middle East and western China. There are some bulbs native to North America, such as Claytonia virginica and Mertensia virginica as well as the trout lily, but they are too often upstaged by fancy exotics. 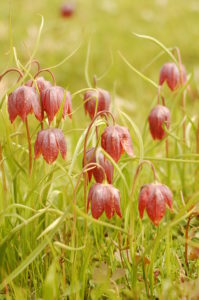 This link offers great options for North American native bulbs that will benefit you and the ecosystem. If you aren’t ready to give up your tulips and daffodils, never fear! By choosing unhybridized species, the flower retains its pollen and nectar, supplying much needed early spring feeding for hungry pollinators. Crocus, species-variety Tulips and Muscari all are well-loved by hungry bees waking up from their long hibernation as well as wild type daffodils such as Narcissus poeticus or N. jonquilla. 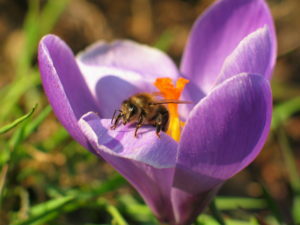 A bee visiting a purple crocus flower. The first step to proper planting is identification – is what you are holding truly a bulb? Corms, tubers, rhizomes and true bulbs all fall under the category “geophyte” (a perennial that stores its food underground). Many rhizomes would not like to be buried as deep as a bulb but corms can be treated much the same. Sorting out the technicalities will ensure correct planting and big blooms! When planting true bulbs, depth is essential. In general, plant bulbs 2 or 3 times as deep as its height. Example: a 2 inch tall daffodil bulb should be planted 6 inches deep. Digging too shallow is better than planting too deep since many bulbs have contractile roots. Over time, these specialized roots will pull it down to optimal depth. Planting root side down/pointed side up is always best, but if the bulbs are too odd-shaped to tell, plant them sideways to be safe. Thanks to geotropism, a plant’s ability to sense gravity and grow accordingly, they will eventually right themselves. So, after much scouring of the internet it seems there is no straightforward answer to Brad’s question. Many highly hybridized bulbs do not benefit pollinators, but other heirloom or species varieties certainly do. To benefit early spring pollinators in your bulb garden, install a few North American species or try to find unhybridized varieties that retain their full species name and their ecological importance. Get out your sweaters and garden gloves, now is the time to get digging! Roadside Beauty: What are you seeing? Fall is the season of change. The verdant green of the prairie melts to lifeless, barren forms – a stark contrast to the landscape that once looked so alive. But for now, as change happens, we are blessed to partake in hues and colors of striking beauty. Trees explode with vibrant shades of orange, red and yellow. 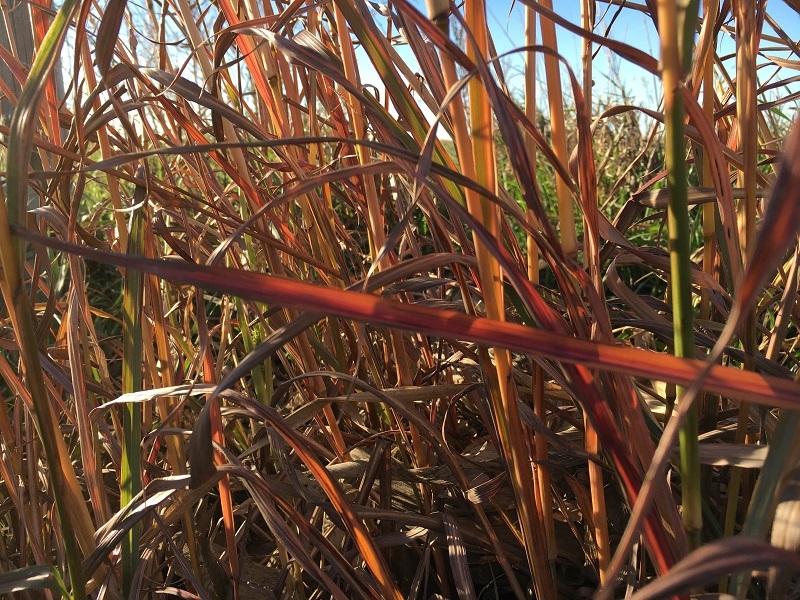 Native grasses develop vivid colors and attractive blooms. Asters, goldenrods and sunflowers speckle the horizon. It is the crescendo of the whole year. Maybe you have noticed these dramatic changes happening, too. Plants that once blended into their surroundings are suddenly visible. It’s as if someone turned a light on them. 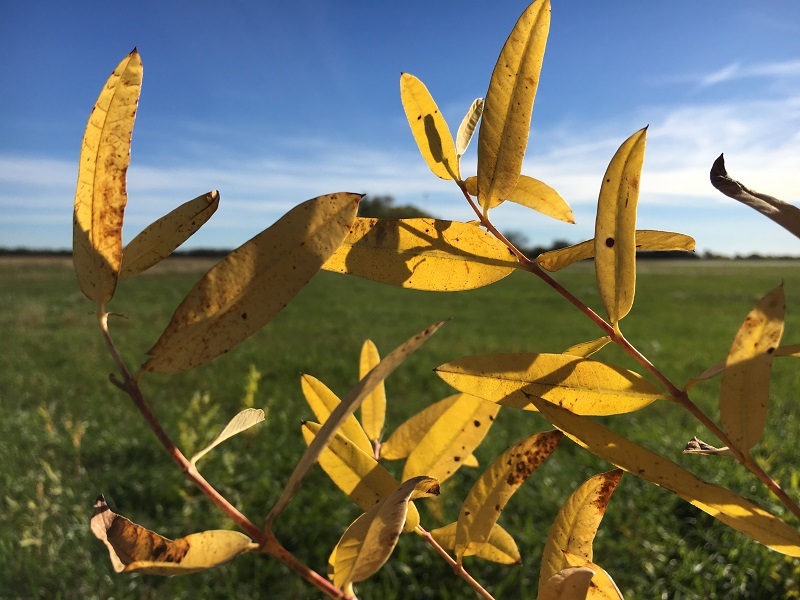 Even the prairies and roadsides display beautiful shades of gold, purple, apricot, olive, and copper with autumn wildflowers, shrubs, and curling, rustling grasses. Here are a few that I have seen lately along the roadsides of south-central Kansas. 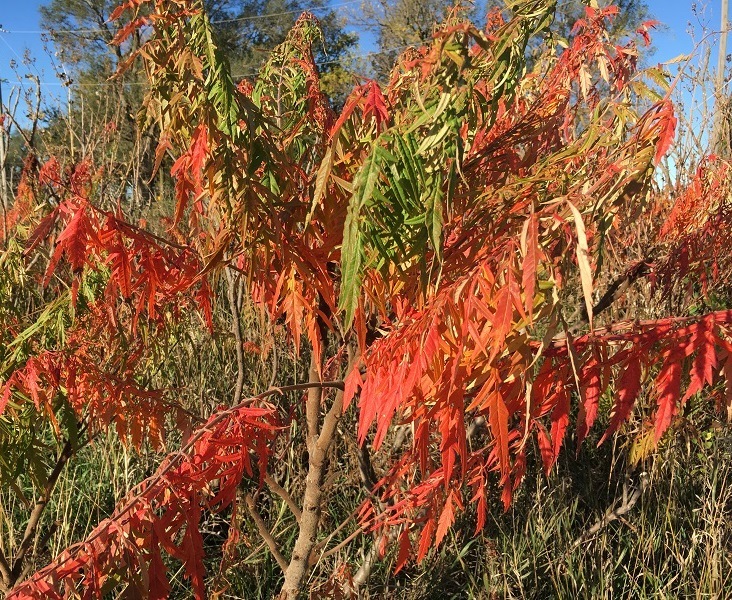 There is no other shrub that signals fall more than sumac. The blood red leaves and clusters of seeds are striking. They are like beacons along the roadsides. If only we could advertise with these shrubs, because they catch my eye every time. This close relative of milkweed has so much going for it. Dogbane is host for many insects. In fact, the US Department of Agriculture Natural Resources Conservation Service (USDA NRCS) ranks Dogbane’s value to pollinators as ‘very high’. Dogbane typically grows two to three feet tall and develops into larger colonies. Right now, they are a bright yellow, which makes them stand out even more. Even the common milkweeds have turned a nice golden color. The “King of Grasses” is big and bold. The reddish purple stems begin to change and set the landscape ablaze with their intense colors. Look for the distinctive “Turkey Foot” seed head, too. 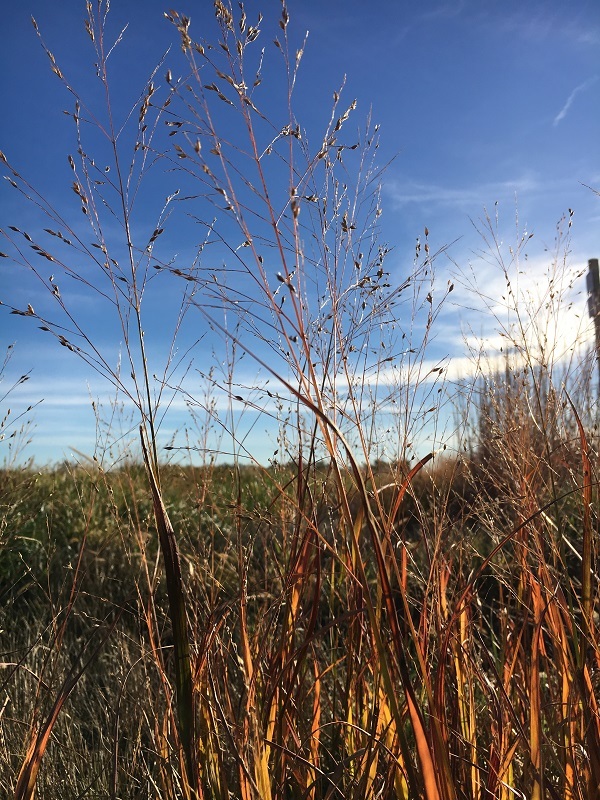 There are a number of outstanding native grasses that provide late season interest, but Switchgrass Panicum virgatum is one of the more common grasses in roadside ditches. It grows to a height of 3-6 feet and turns orange, yellow and fiery red-tipped shades in the fall. The persistent airy blooms and attractive fall colors make this an attractive grass in the landscape. This tree is along many roadsides in south central Kansas. 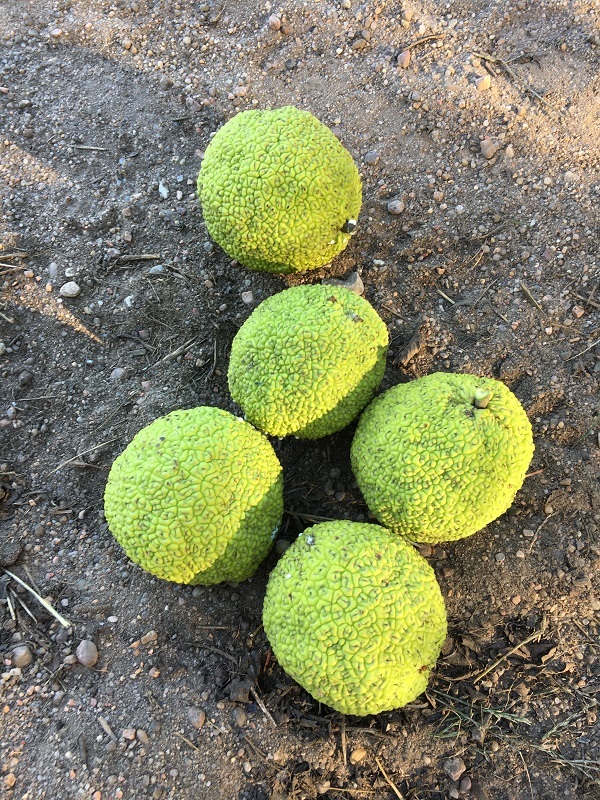 It is still incredible to see those huge hedge apples dangling from the branches and scattered on the road. The tough demeanor of this tree including its thorns made it ideal as a living fence. Many were planted during the Dust Bowl days as part of WPA projects to prevent soil erosion in the Great Plains states. Asters are the grand finale to the prairie garden. Heath asters are one of the last asters to bloom. 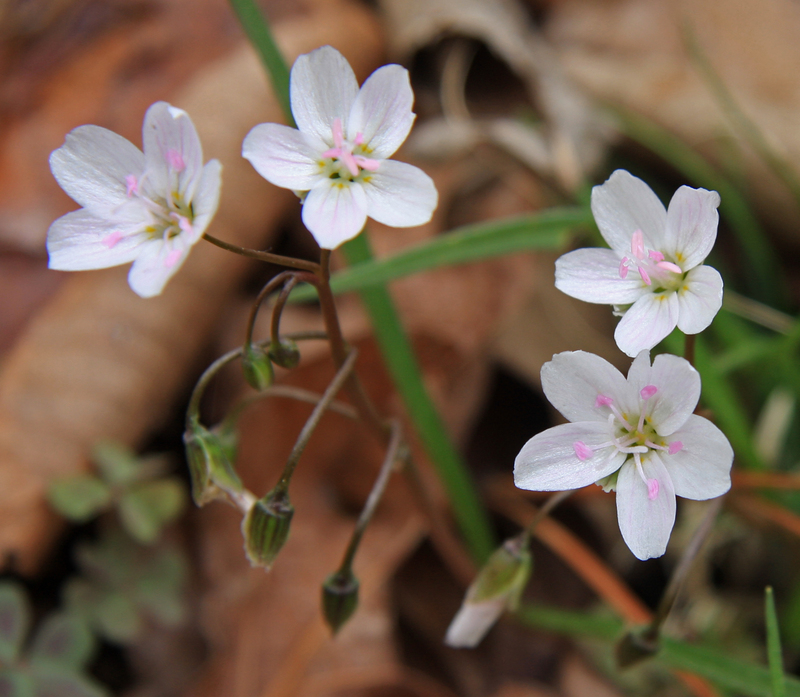 The diminutive white flowers cover the entire plant, making them look like snow mounds in the prairie. They are one of the last great feeding opportunities for bees, butterflies, and other pollinators before they migrate or go dormant for the winter. Although each season is different, autumn is a very special time. Life has come full circle, from spring through summer and ultimately ending in the fall. It is the perfect time to enjoy all that is changing around us. 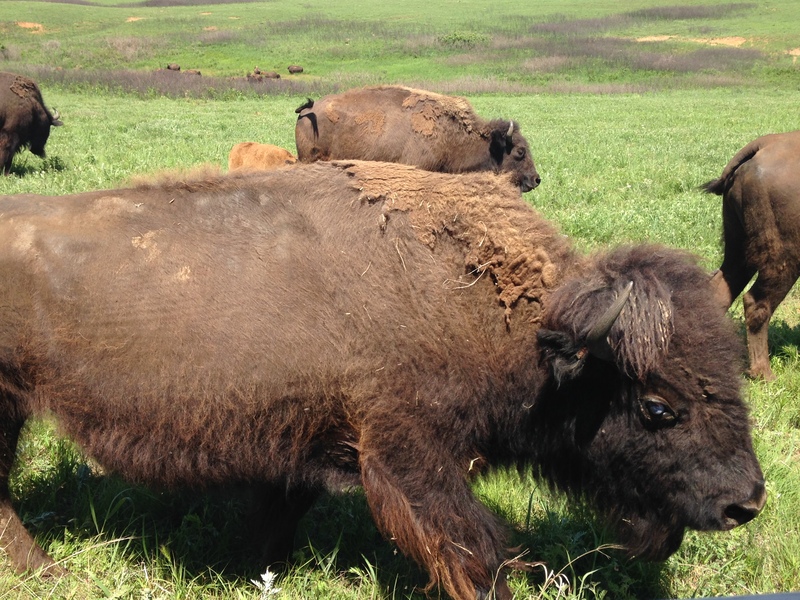 It is a time to take in sights, sounds and smells of the prairie and connect anew with the natural world. 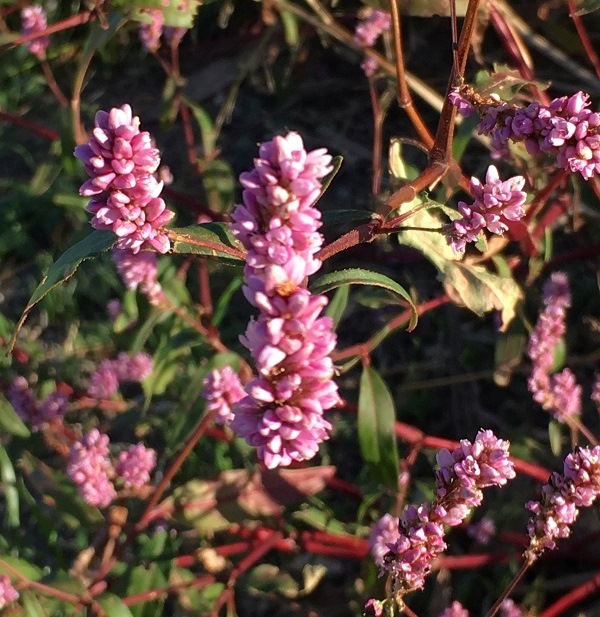 Pink smartweed is prolific, growing wild in nearly every roadside ditch. The bright pink flowers and red stems are very striking. They thrive in damp or wet sites, but it is an annual. If you want some for your landscape, collect the seed after the pink flowers fade. On my recent trip through eastern Kansas and the Ozarks, I encountered a plethora of native plant life. I was excited to see some of the woodland species we offer at our plant sale in situ. My traveling companions may tire of me identifying familiar species, but that doesn’t stop me! Though much of our focus here at the Arboretum is aimed at prairie species, our native woodland landscapes in the far eastern part of the state are just as interesting and diverse. When driving east, those small wooded areas are just the introduction to the vast forests of the Ozarks up ahead. Woodlands support a very different set of flora and fauna. Birds, deer, and groundhogs are active in these forests, filling their own forest feeding niche. Tall canopy trees, such as maple and oak, provide the shade and protection that all species beneath them require to flourish. While hiking I saw some of my favorite under story trees – pawpaws (Asimina trioloba) along the stream banks at Petit Jean State Park (AR), sassafrass (S. albidium) at Ha Ha Tonka State Park growing in a clearing. 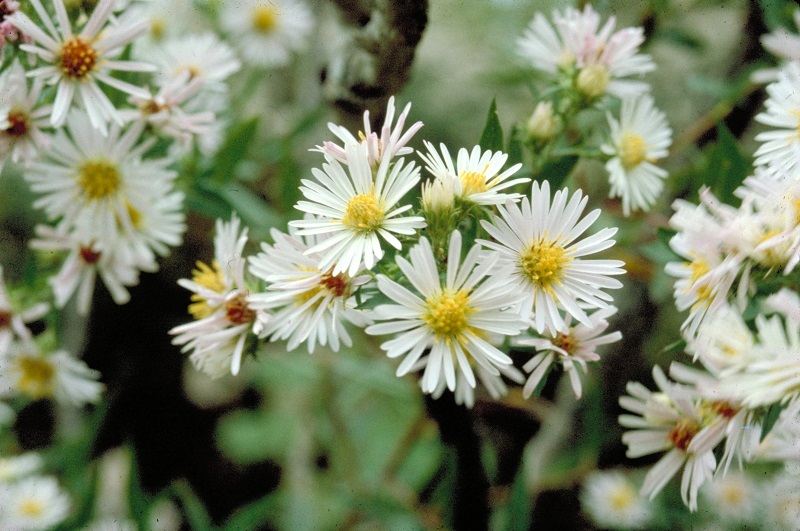 Beneath the under story layer creep the shade-loving late-season flowers like woodland aster (Symphyotrichum cordifolius, S. laevis) and certain goldenrods (Solidago caesia, Solidago ulmifolia). I was delighted to see them blooming away, attracting pollinators to take their last gulps of nectar before winter. 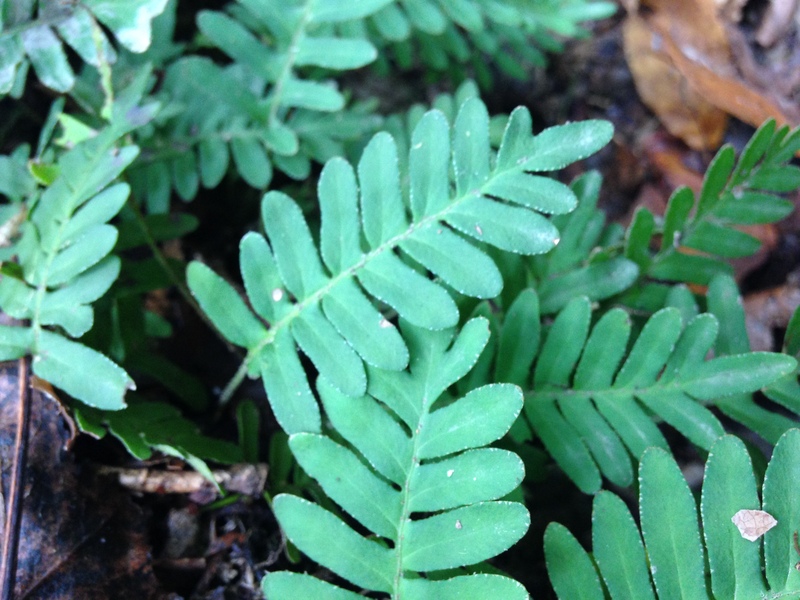 Ferns were abundant in the lowest areas of the forest where water collects and dew settles – the resurrection fern seen below can bring itself “back to life” after being without water for 100 years! Traveling home through forested northern Arkansas and far southeast Kansas instilled new appreciation for the bald, rolling hills of the prairie we encountered closer to home. The steep hills (or mountains, as the natives may call them) and rock formations create a unique, rugged landscape that slowly mellows as you move westward into Kansas. The rocky habitat hosts pines and cedars that seem to grow right out of the solid rock walls. 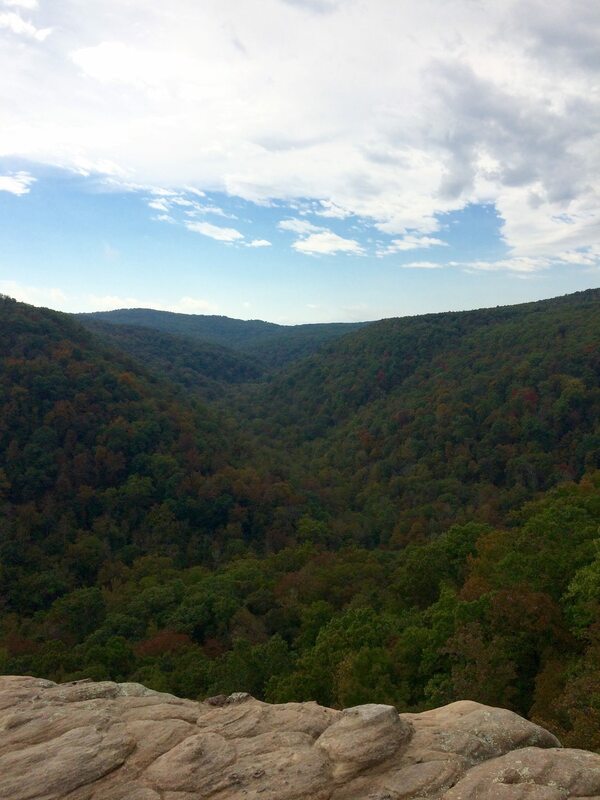 The karst topography of Missouri and Arkansas was fascinating! The lay of the land creates seasonal streams and caverns, even underground lakes. These formations are in part due to the chemical make up of soft and hard of rock which dissolve at different rates over time. The view from Whitaker’s Point down into Hawksbill Crag near Boxley, Arkansas. It’s an hour hike up to this rock, and so worth it! 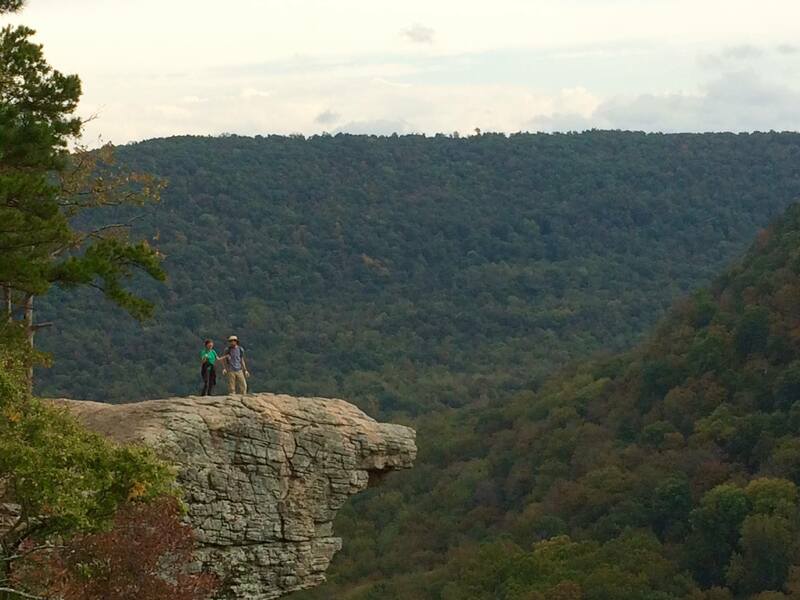 Some fellow hikers were kind enough to take a picture of us on Whitaker point. 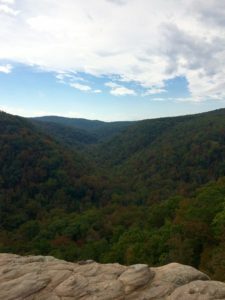 Though we may not consider forests symbolic of Kansas imagery, the easternmost part of our state is home to woodland habitats which form a sort of gateway to the Ozarks. I enjoyed my trip and wish I could enjoy shady hikes and rocky crags every weekend. 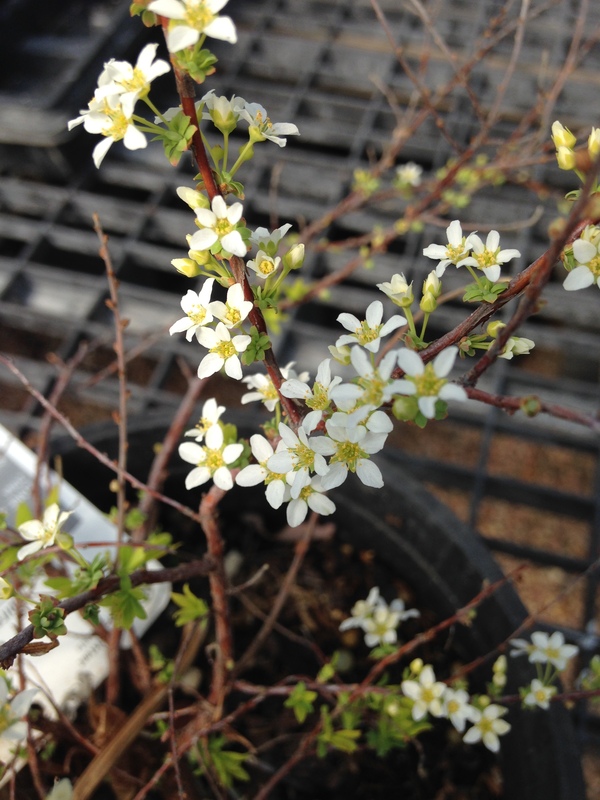 Luckily, we feature many of the woodland species in this blog post at our plant sale – I can plant a woodland garden of my own to enjoy a bit of eastern habitat… without planning another vacation! I encourage you to embrace thistles. Our South Central Kansas native species are colorful and attractive to pollinators. 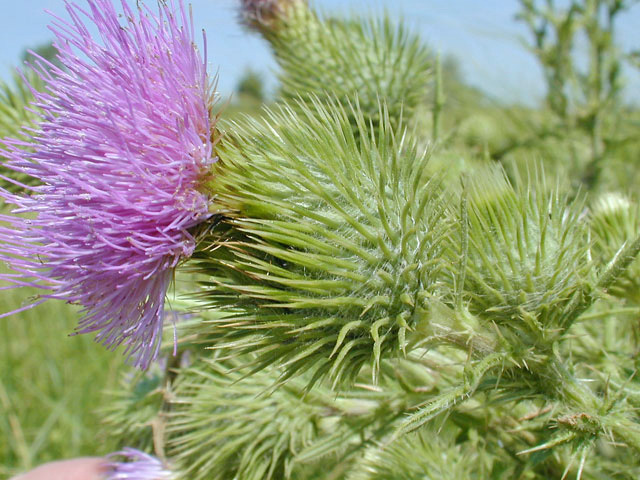 With the abundance of precipitation we’ve received this year, it has been a great year for plant growth and flowering, and thistles have certainly been among the benefactors. Don’t be so quick to dig out every plant you find. 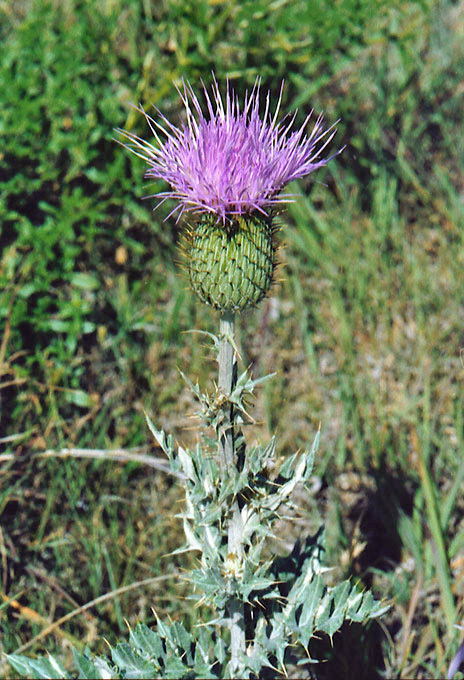 Thistles are an often prickly topic and one to make many prairie landowners bristle. 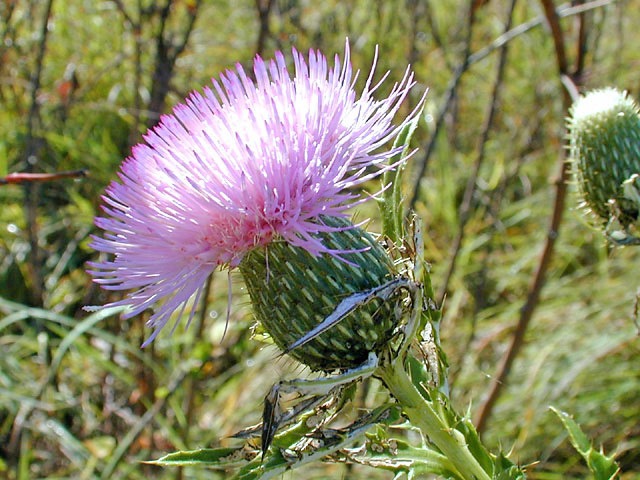 A number of thistle species are on the Kansas noxious weed list, including bull thistle (Cirsium vulgare), Canada thistle (Cirsium arvense), and musk thistle (Carduus nutans). So, it is no wonder, that the mention of these species makes us cringe. When present on a site, they are often dominant and problematic. 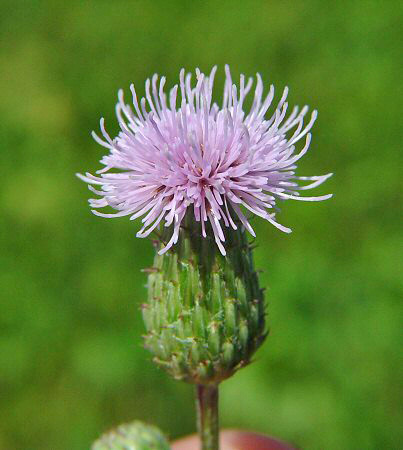 There are, however, two native thistles found on our South Central Kansas prairies that often get a bad rap because they are confused with their noxious and more invasive relatives. 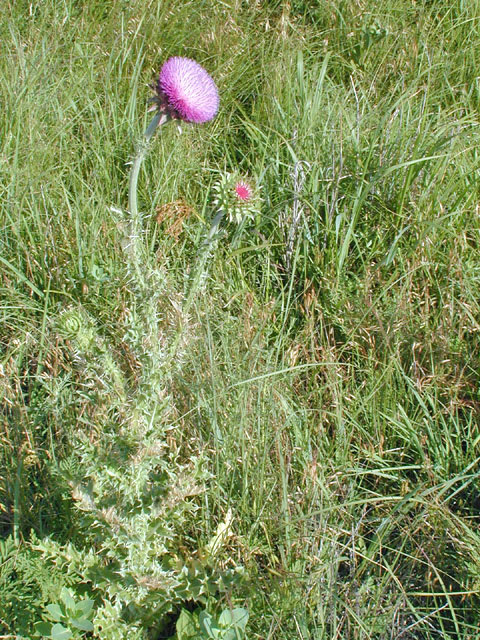 The native species, undulating thistle (Cirsium undulatum) and tall thistle (Cirsium altissimum) are the only thistles I have found on most South Central Kansas prairies I visit. They have beautiful flowers and play an important role as a nectar source for many species of butterflies and other insects. When in the peak of their respective bloom times, undulating and tall thistle flowers are hot spots for a host of insect pollinators, the predators that eat these insects, and birds (especially finches), who will later eat the seeds. The following table provides more information about the native and non-native species found in Kansas. Thanks to Mike Haddock (http://www.kswildflower.org) for some of the photos and information compiled for this post. Here at the Dyck Arboretum it can be a tricky task deciding what is a weed to be pulled and what should be allowed to grow on. Many of our beloved volunteers look to me for guidance when they encounter a plant that looks out of place. What is a weed here? 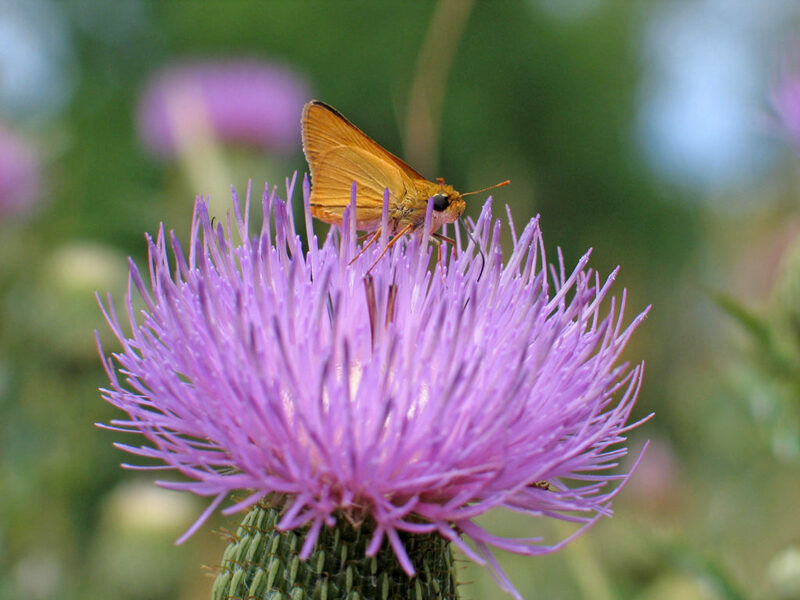 Many wonderful prairie plants carry the misnomer of “weed”, such as butterfly weed, iron weed, and milkweed. These are plants that may or may not need to be pulled, depending on where they are located. I consider a few factors: does the plant belong here or fit the theme of that garden bed? Is it annual or perennial? Will it become invasive? Is it part of a plant family that is notorious for colonizing? …and so on. Weeding will become less of a guessing game when you learn to identify some native species and particularly those nasty exotics. 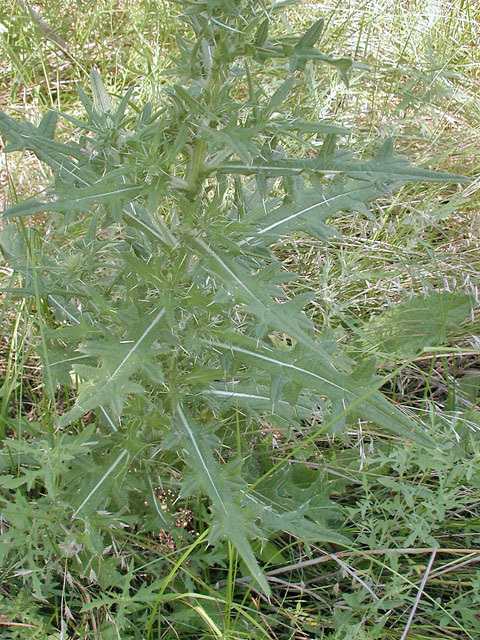 While the name ‘milkweed’ might cause you to shun this plant for your garden, think before you pull! In the right area, milkweeds may be a perfect addition. They will bloom for several weeks and add a bit of important monarch habitat to your backyard. 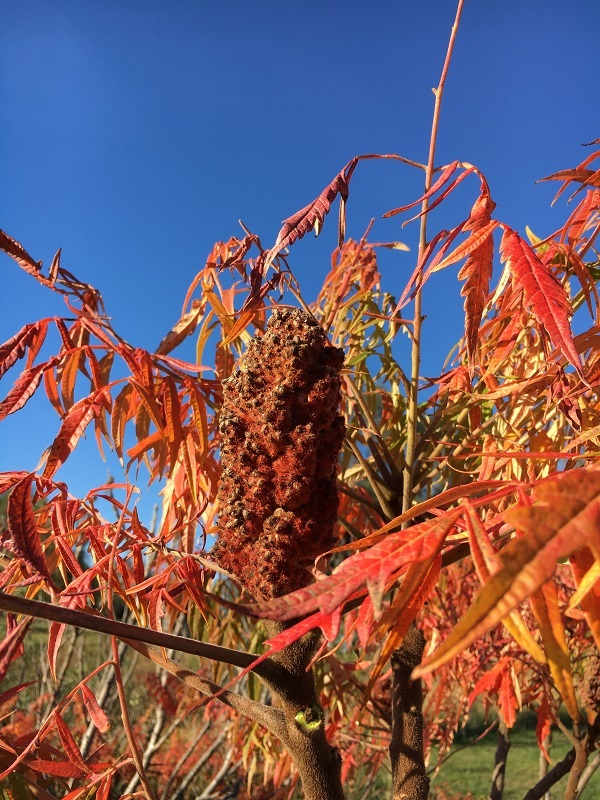 Photos from Dyck Arboretum. Just when you think you have weeded every last square inch of your garden, here they come again. The seed bank – dormant seed that exists in the top soil – will continue to produce more weeds as long as conditions are favorable. Seeds can lay dormant in the soil for long periods of time, waiting for adequate moisture and light levels. Bindweed seed can remain viable in the soil for up to 50 years! The seed bank is created by last year’s mature weed seeds, bird droppings, hay/manure used for mulching, and seeds carried on the wind. The good news? With regular weeding and mindful practices you will decrease your weed seed bank every year. That means pulling weeds before they seed, using carefully sourced mulch material, and disturbing the soil as infrequently as possible to reduce the amount of dormant seeds awakened by light and oxygen. Bindweed with it’s morning glory bloom, Siberian Elm saplings with their small serrated leaves, and prostrate spurge with its circular, flat habit all send up the red flag. These kinds of plants look out of place right away because they lack charisma and often grow in inhospitable areas. (i.e. in driveway cracks and gravel, climbing up stems of other plants). Virginia creeper vine seems to crop up everywhere, and are very decorative if left to grow in a good spot. But they can also be aggressive when not trimmed regularly. Similarly, a mulberry sprout (which tend to come up just about everywhere a bird flies over), could be left to grow into a nice fruiting tree if you are prepared for the berry-mess and seed spread. Plants like ironweed and Illinois bundleflower seem to pop up everywhere and, though they can be aggressive spreaders, they are also quite attractive. 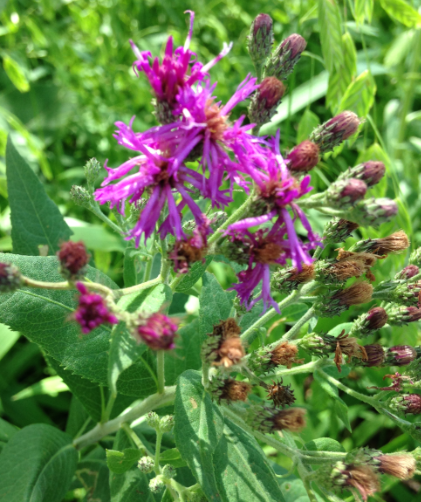 Ironweed (Vernonia sp.) may at first appear as an intruder, but it produces a long lasting bloom and is visited by many species of bees. Photo from Dyck Arboretum. I always advocate for leaving milkweed in the garden as habitat for monarchs. Lucky you if a few come up! Other species like purple poppy mallow and wild petunia that may appear weedy at first actually make well behaved native specimens. These species bloom all summer long and are extremely drought tolerant. While you pull and pluck away at the weeds in the garden, remember the wise words of the poet Ella Wheeler Wilcox – “A weed is but an unloved flower”. Although weeding is the tedious task all of us gardeners must endure, you can make it easier and more productive by knowing the difference between potential friend and foe. In the past few weeks I have had the good fortune to visit several different prairies, each under different circumstances, all of them delightful in their own way. Here’s a tale of 3 prairies for you, in hopes you become inspired to visit these places as well! Willa Cather Memorial Prairie near Red Cloud, NE. I had just finished up the last few pages of Cather’s well-loved novel My Antonia as we rolled into the city of Red Cloud. A friend and I made a day trip to Webster County to take in the sights and sounds of Cather’s world, including this prairie just west of town which may have been the inspiration for some of her famous descriptions of plains life. 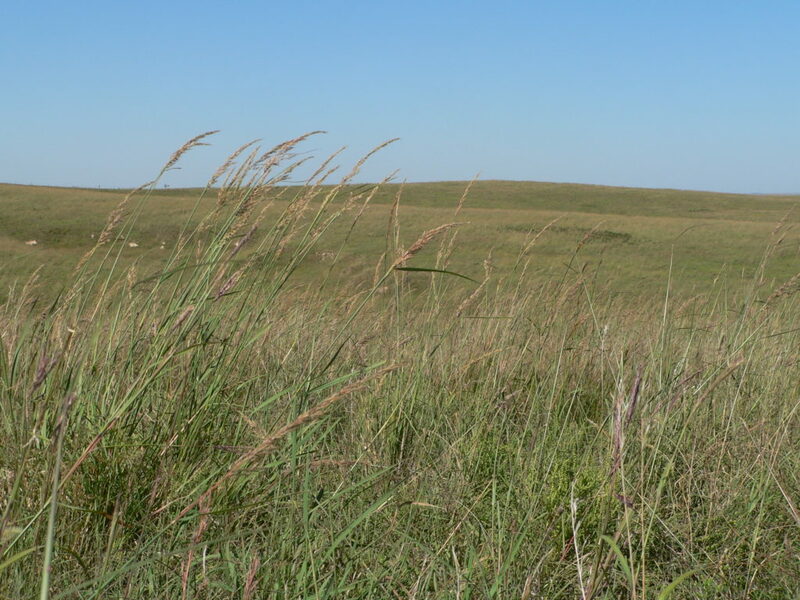 If you are a lover of the prairie, you need to put Willa Cather’s work on your reading list immediately, then scurry up to Nebraska and tour her hometown, Red Cloud, (renamed “Black Hawk” in My Antonia) which is also the home of the Willa Cather Foundation. There you can have a personalized tour of her childhood home, church, and neighborhood along with the opera house and historic bank building, all still in turn of the century style. While hiking in her short, windy memorial prairie I saw lots of familiar species – silver sage (Artemisia ludoviciana), purple poppy mallow (Callirhoe involucrata) and little bluestem (Schizachrium scoparium). View west from our seats. Who would want to watch the musicians when you can gaze at this? We were far from the stage but we could hear them perfectly! 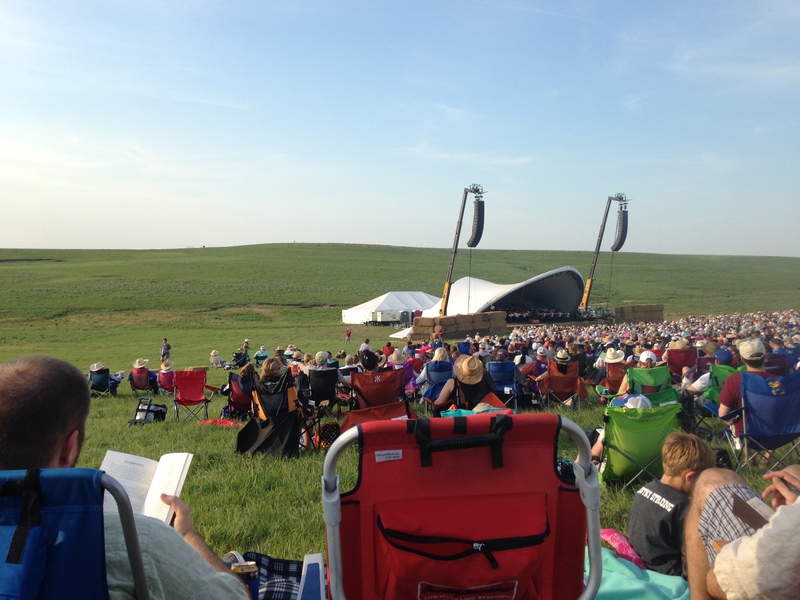 I wasn’t planning on going to the Symphony in the Flint Hills, but through the kindness of an acquaintance two tickets fell into my lap, free of charge. So with lawn chairs in tow my date and I headed out to a pasture near Clements, KS in Chase county. There was delicious BBQ to be had and an art gallery and information tent to peruse before and after the concert. The music was provided by the Kansas City Symphony; gorgeous selections were wonderfully preformed, including American folk tunes and well known tracks from Dances With Wolves and Indiana Jones. Top it all off with a live cattle drive on the hill behind the stage and the music bouncing off the hills around you, it was the perfect afternoon. The weather even cooperated – I never broke a sweat! The prairie was looking lush from recent rains; I couldn’t help but geek out on the species I recognized on the 3/4 mile walk back to the car – blue false indigo (Baptisia australis) and spider milkweed (Asclepias viridis). Save up some cash and treat yourself to this art-filled prairie experience next year! During the EPS week here at the Arboretum, I had the privilege of chauffeuring some of the participants on their field trip to Maxwell Wildlife Preserve. A good day at work, to be sure! 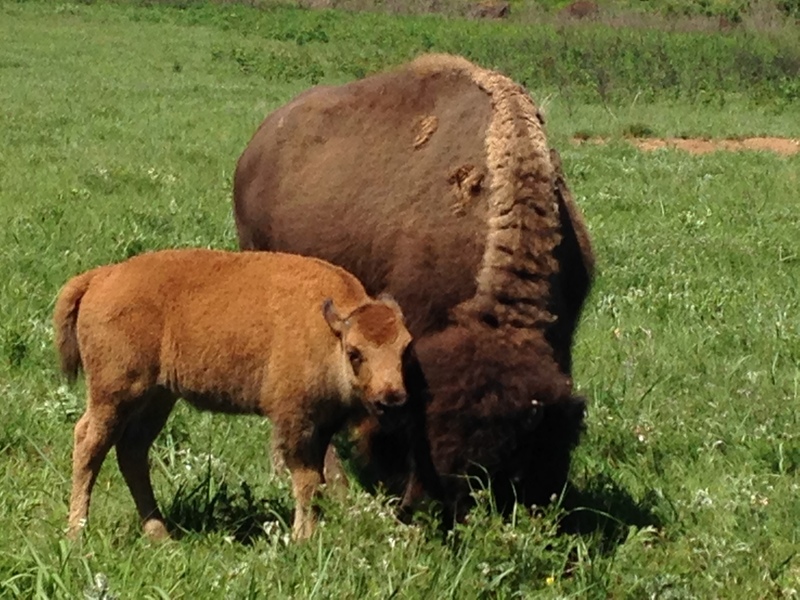 It’s a beautiful expanse of preserved prairie that is home to Elk and Bison. View near the Maxwell observation tower. The walled trailer we were riding on let us get extremely close to the bison without the danger. Incredible viewing! Calf and mother stick close together. The tour guides were charismatic and knowledgeable, providing a history of the refuge and a natural history of the land. The prairie there is healthy and diverse, giving us a look at butterfly milkweed (Asclepias tuberosa), lead plant (Amorpha canacens), goats rue (Tepherosia virginiana) and rattlesnake master (Eryngium yuccifolium). Each prairie region has its own unique charms, from thick tall grass areas in the east to short and scrubby land in the west – Carve out some time this summer to visit and compare!